Tesla delivered 8% more vehicles in the third quarter than Wall Street analysts had expected. 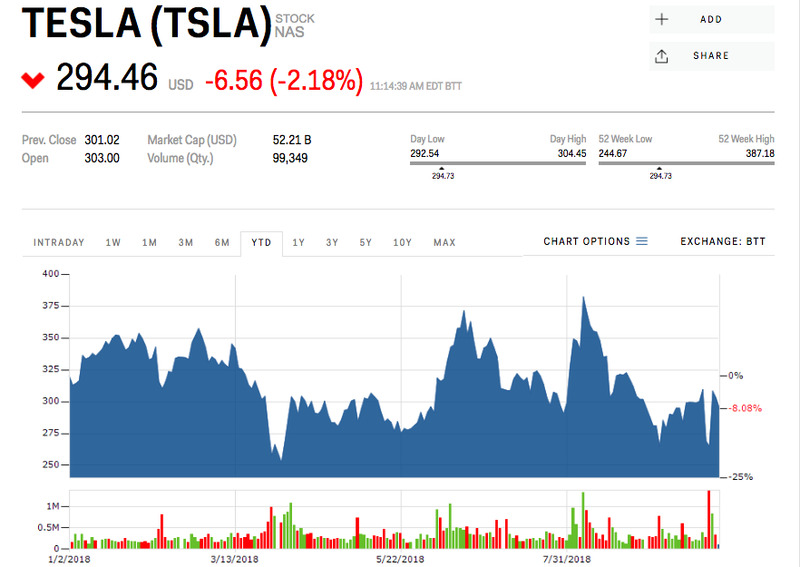 Still, the stock sank following the announcement and was continuing to slide Wednesday as analysts began looking to Tesla’s third-quarter earnings later this month. The company is expected to report its results on October 31 – when all eyes will be on its bottom line. Tesla’s total deliveries for the third quarter easily topped Wall Street’s expectations this week, but a coming quarterly earnings report and CEO Elon Musk’s departure as board chairman have analysts turning their attention back toward the electric-car maker’s balance sheet. Wall Street analysts won’t be convinced of profitability until they see it in a regulatory filing, expected October 31. Galliers estimated that the delivery beat – a few thousand vehicles ahead of the Street’s expected 80,900 – could add $US488 million of revenue and $US105 million of profit to Tesla’s third-quarter results later this month, an amount he said was probably not enough for the company to become profitable. Tesla’s second-quarter earnings, released August 1, showed a negative free cash flow of $US739 million, which translated to a loss of about $US3 a share. A cash burn of that magnitude has most analysts factoring in a capital infusion to their models before the end of the year. “We doubt that the all hands on deck burst mode for production and deliveries will result in profitability in 3Q, but believe the shift toward AWD production in 4Q could enable the company to achieve profitability on an adjusted basis in 4Q, though we are not forecasting GAAP profitability,” Jeff Osborne, an analyst at Cowen, said following Tuesday’s announcement. He has an “underweight” rating and $US200 price target for the stock. “We still see the need for a raise in 4Q of $US2 billion,” he added. 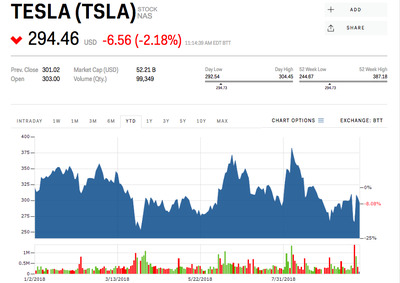 The Wall Street consensus for Tesla shares has fallen to $US291, from above $US300, in recent weeks amid the fallout from the Securities and Exchange Commission’s lawsuit against Musk and its subsequent settlement. Shares have been holding in that range as investors are most likely waiting to see who will helm the board of directors in Musk’s absence – a key part in his $US20 million settlement with the SEC. The New York Times reported Tuesday that James Murdoch had been eyed by some board members as a potential replacement, though outside groups like the proxy monitor Glass Lewis have voiced concerns about Murdoch’s lack of relevant experience. Tesla shares are down 5.4% this year.